NOSE: The cask-conditioning greatly subdued the hop forward aroma which actually leaves the brew smelling more like a Saison than a Belgian IPA. There’s still a good amount of floral aroma and a hit of lemon zest, but they’re much more muted than expected. Instead the funky farmhouse nose from the yeast and a the sweet, clean aroma of pilsner malts are the major players. TASTE: Same as the nose…the hop bitterness you expect from a Belgian IPA has been greatly reduced in the cask. Instead, it’s a muddled, but very pleasant blend of sweet, pale malts, grassy pilsner flavor, mustiness, a touch of pepper and spice, and a little citrus in the finish. MOUTHFEEL: Frothy and light-bodied, unusual, but not unwelcome for the style. DRINKABILITY: Quite high. 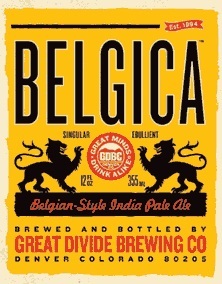 The cask probably dampened a lot of the best parts of the Belgica, but it left a highly drinkable, very refreshing brew. Posted in Tasting Notes.Tagged Belgian IPA, Belgica, Cask, Great Divide, J. Clyde.